Milford, IN - Brock Grain Systems has introduced its INTUI-DRY™ Dryer Control to provide on-farm and commercial grain operators with simplified monitoring and control of their Brock grain dryers. “The INTUI-DRY Controller uses the same proven Brock drying algorithms, but gives operators more control, improved reliability and ease of use,” said John Tuttle, Director of Sales for Brock Grain Systems. 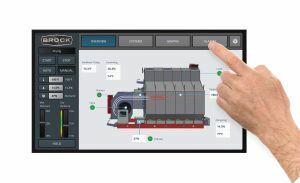 The controller features an easy-to-use 15.6-inch touch-screen display that provides intuitive management of all aspects of dryer operation. Any alarm events are displayed with identification codes and accurate timestamps. The INTUI-DRY Control is built with solid-state components and a completely new software system that is designed for reliable operation and intuitive dryer management. It also has quick connectors and fewer components than previous controllers for easy repairs and low maintenance. This controller connects to Brock’s low profile and tower dryers using readily available standard Ethernet cable. Grain operations that have PLC controls can use the INTUI-DRY Control to communicate using industry-standard protocols. The INTUI-DRY Controller comes with a mobile app that provides remote access through a smartphone, tablet or laptop computer. It lets operators monitor and control their dryer system from nearly anywhere, improving efficiency and management. “This new, advanced controller is just the latest innovation that we build into every Brock dryer system,” explained Tuttle. Brock dryers also feature true moisture-based control utilizing incoming and outgoing grain moisture sensors, quiet centrifugal fans, full flame-wall burners, a patented MOISTURE EQUALIZER® System, and a patented gentle grain handling dryer unload system. The INTUI-DRY Control is available with all new BROCK® Commercial Tower Dryers, MEYER ENERGY MISER® Tower Dryers and SUPERB ENERGY MISER® Low-Profile SQ Series Dryers. More information and examples of various control screens are available at www.BrockINTUI-DRY.com. For more information, please contact 574-658-4191 or sales@brockgrain.com.